In the beginning of time, three living worlds emerged: Dreamland, the Dark world, and the Human world. In Dreamland, the Kingdom of Vecanti has been ruled by Queens for centuries. The Dark world has been governed by six powerful Dark lords. The Human world, is the world as we know it. Since the beginning, these three worlds, in addition to the already existing Perfect world and its neighbor Sutherland, have been in a delicate balance of power with each other... until now. Since its creation, the Dark world has been in trouble. Soon after the six Dark lords took power, a netherspace window was opened up, and it has been slowly absorbing the Dark world ever since. GLAMES, King of the Dark world, realizing that his world is coming to an end, has made several attempts to conquer Dreamland, using his generals, ROGLES and MEGAS. However, both generals have failed, and now GLAMES, himself, has decided to invade Dreamland, before his world is destroyed. At the dawn of time, two magical swords were forged: The Valis sword and the Leethus sword. Legend has it that only the bravest of warriors can use these powerful magical weapons--and if any one person were to have both, their power could be used for terrible destruction. King Glames owns the Leethus sword and is using its power to conquer Dreamland. 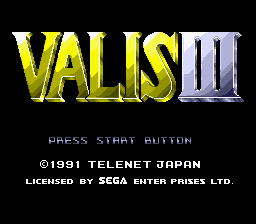 Only the fabled warrior of Valis, wielder of the Valis sword can stop him now... the fate of Dreamland hangs in the balance. Yuko Ahso, who up until recently, was a student living a normal life, is the heroine of our story. One day, not long ago, she discovered that her destiny was to become a warrior in the land called "Dreamland." Queen Valia, the Ruler of Dreamland, summoned Yuko from the Human world, to save her Kingdom from the Dark King Rogles. Valia told Yuko of her destiny to become the warrior of Valis and bearer of the Valis sword. Yuko assumed her role as the Valis warrior, and managed to defeat the plans of King Rogles and restore peace to Dreamland. However, this peace didn't last long, and Yuko was soon commanded to return to Dreamland, where she was to fight as the Valis warrior, once again. This time, Dark King Meglas had invaded Dreamland. But, as the Valis warrior, Yuko was once again able to defeat his plans and thwart the invasion. After the final battle with Megas, Queen Valia passed away. After reading her will, Yuko discovered the truth about her past. Queen Valia had never told her that Yuko was one of Queen Valia's twin daughters. Princess Valna, Valia's heir to the throne of Dreamland, was really her sister. Yuko was so moved by the knowledge of her true identity, and the loss of her mother, that she vowed to restore peace to Dreamland, forever.